New Storage and Transportation Solution Protects Nintendo Switch, Dock and Multiple Accessories for the Ultimate On-The-Move Gaming Solution. New carrying Case for Nintendo Switch simple accessory that offers storage for all your gaming items. 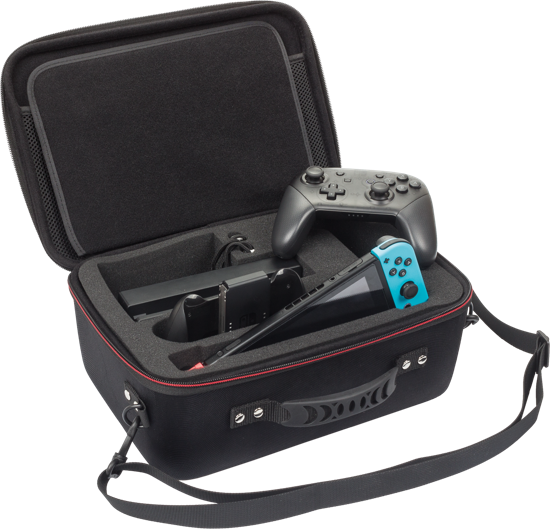 The Carry Case offers a one-stop storage solution, providing ample space for the Switch console, Dock, Pro Controller, Joy-Con Controller Grip, cables and up to 21 games! High-performance protection is provided via the robust outer shell and adjustable carry strap, designed to protect your hardware from bumps and scratches associated with travel. In addition, the internal foam is designed to mould perfectly around all of your Switch components. Lightweight, durable and portable, the Carry Case is a stylish addition to any console owner’s collection, built with the highest quality materials, for reliable and safe storage. The Carry Case is priced at £29.99 (UK) and is available from Amazon and other leading gaming retailers.